My daughter has taken over my Ipsy subscription and I'm very excited that last month I was finally off the waitlist for Sephora Play! Like Ipsy, Sephora Play is a monthly beauty box that delivers deluxe samples to your door step for $10/month. The samples are from the same prestige brands that they carry in the store. Along with the samples, you receive a Play Book with helpful tips, a Play Pass to redeem in store for a free 1:1 tutorial + 50 extra bonus points and a collectable makeup bag. The only downside is that it's not customizable like other services, but for me, that's okay! Here's what I got in my May Play box! Bite Beauty Amuse Bouche Lipstick. The Kimchi - Shocking Pink shade looks a little bright but is actually very pretty on. It's creamy texture glides on and it's long lasting too! Korres Wild Rose + Vitamin C Advanced Brightening Sleeping Facial. I used this product a few winters ago and was a huge fan. The night cream/mask combo evens out your skin tone and brightens your complexion! Briogeo Dont' Despair, Repair! This is a deep conditioning mask for hair to restore hydration and help protect your hair from future damage. It does a good job conditioning but I didn't see any difference between this and my other conditioners. TARTE Tartiest Lip Crayon. The Latergram mauve shade is a versatile neutral. The sample size is very thin so you have to be careful applying as it's easy to break. Atelier Orange Sanguine Cologne. I'm pretty picky when it comes to fragrance but this one smells divine! It light and fresh! Origins Maskimizer Skin Optimizing Mask Primer. I didn't even know mask primers existed. It preps, primes and get's your skin ready for a mask. It also came with two mask samples, the Origins Charcoal and Overnight masks. It helped spreading the mask on but I don't know if it's worth the extra step. Overall I loved this box and am looking forward to getting the next one this month! 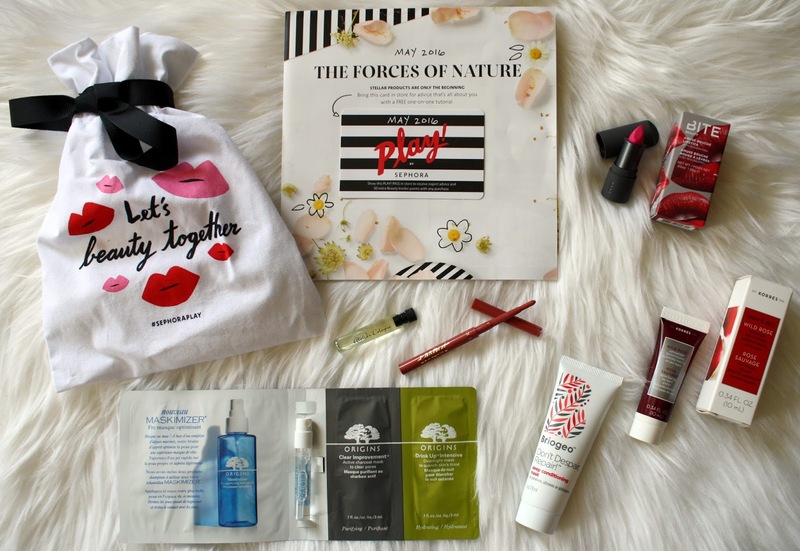 If you're thinking about trying a new beauty subscription, I think you will like Sephora Play! Click here to sign up!